With a career that has spanned more than five decades, Barry Gibb stands as one of the most prolific singer/songwriter/producers of the modern era. As the co-founder and creative leader of the “Brothers Gibb,” better known to the world as the Bee Gees, Barry Gibb, along with his brothers Maurice and Robin, represent one of the most successful vocal groups in rock and roll history, having sold more than 200 million albums to date. With their signature vocal style and blending of musical influences, the music of the Bee Gees has crossed all musical genres from pop and R&B to country and rock, and became the face of a new genre of music when they ushered in the age of disco with their contributions to 1977’s mega-hit soundtrack for SATURDAY NIGHT FEVER. Considered Britain’s “First Family” of harmony, Barry Gibb and his brothers were born in Douglas, Isle of Man, where they gravitated to music early on – encouraged by their big-band leader father Hughie Gibb, who saw the trio as a young version of The Mills Brothers. After relocating to Australia, the young trio began booking gigs and appearing on local television shows – performing songs written by Barry. Following a succession of Top 10 singles in Australia, including the 1966 hit “Spicks and Specks,” the brothers told their parents they wanted to return to England to pursue their musical dream. Like many of the young bands emerging from Britain at the time such as The Beatles, The Animals, The Moody Blues, The Byrds and The Yardbirds, their music was heavily influenced by the country and R&B recordings that were coming out of America at the time. It would be those influences that served Barry and the brothers best, as their musical journey progressed in the decades to come. Over the next two years, the group launched a string of hit singles executed in a brooding, distinctively British pop style. Their first internationally released album, NEW YORK MINING DISASTER 1941, an original by the group with a haunting melody and a strangely surreal, almost psychedelic ambience, was released in mid-1967 and made the Top 20 in England and America. The trio started the 70’s with another round of pop hits including “Lonely Days” and “How Can You Mend a Broken Heart,” their first #1 hit song in America. It would become the first of nine #1 singles for the Bee Gees. Evolving musically to create a progressive pop/rock sound, their album, MR. NATURAL (1974) was a departure with its heavily Americanized R&B sound, and the following year they plunged headfirst into MAIN COURSE – the emphasis now being on dance rhythms, high harmonies, a funk beat, and a new sound spearheaded by Barry, who, for first time, sang falsetto and discovered that he could delight audiences in that register. MAIN COURSE found them taking a breezy, rhythm and blues oriented approach, exploiting their upper registers on such danceable mid-decade smashes as “Jive Talkin,” their second American #1 single, and “Nights On Broadway,” and would establish them as key architects of the emerging disco movement. But it would prove to be just an appetizer compared to the awesome run of #1 hits that followed from 1976 to 1979. Plunging further into soul music, emulating, in their own terms, the funkier Philadelphia soul sounds that all three brothers knew and loved, in one fell swoop, the group had managed to meld every influence they’d ever embraced, from the Mills Brothers and The Beatles to early – 70’s soul, into something of their own that was virtually irresistible. But it was what came next that would cement the band’s presence at the musical epicenter of the decade, when they became the driving force behind what would become the biggest selling soundtrack of all-time, SATURDAY NIGHT FEVER. Their featured numbers on the soundtrack to SATURDAY NIGHT FEVER, “Stayin’ Alive,” “How Deep Is Your Love,” and “Night Fever,” as an album and a film, supercharged the phenomenon and broadened its audience by tens of millions, with the Bee Gees at the forefront of the music. Released prior to the film’s opening, the first single, “How Deep Is Your Love” would reach the top spot on the Hot 100, but before the film’ soundtrack had even been released, “Stayin Alive” would follow its predecessor’s route of landing in the top spot on Billboard’s singles chart to become the second consecutive chart-topper. The electrifying, heart-pounding, driving “Stayin’ Alive,” would be the second single for the soundtrack and was released not only before “How Deep Is Your Love” would reach the top spot on the Hot 100 chart 13 weeks later. It would remain in the Top 10 for 17 consecutive weeks – the longest run of any single since the chart’s inception. The third single from the soundtrack would be “Night Fever,” and be the third straight to reach the #1 spot on the charts, making the Bee Gees the first group to have three singles in the Top 10 at the same time, and the first group to have the top two songs on the charts since The Beatles. For three consecutive weeks, the Bee Gees were responsible for writing and/or producing five records in the Top 10: “Night Fever” and “Stayin’ Alive”; “Emotion” for Samantha Sang; “(Love Is) Thicker Than Water” for little brother Andy Gibb; and “If I Can’t Have You” for Yvonne Elliman. “(Love Is) Thicker Than Water” and “If I Can’t Have You” would land in the top spot on the charts; and the group would become the first and only songwriters to place five songs in the Top Ten at the same time. Yvonne Elliman’s “If I Can’t Have You,” was the fourth consecutive #1 single to be written by Barry Gibb, breaking the record set by John Lennon and Paul McCartney. Meanwhile, the soundtrack to SATURDAY NIGHT FEVER would sell more than 40 million copies worldwide, and become one of the biggest selling soundtrack of all-time. Charities were often the beneficiaries of the Bee Gee’s generosity. They staged a benefit to thank the city that inspired “Nights on Broadway” by playing a sold-out concert at Madison Square Garden in New York, and donating all the proceeds to the city’s Police Athletic League. However, their biggest contribution to charity was yet to come. In 1978, they agreed to participate in “Music for UNICEF,” an effort by the United Nations to support the agency dedicated to helping children around the world. As a part of the project, they would donate the royalties from their next single to UNICEF. In 1979, they released SPIRITS HAVING FLOWN – their crowning commercial triumph, topping 30 million in sales, and yielding three more #1 singles. The first single, “Too Much Heaven,” would reach the #1 spot on Billboard; the 7th number one single for the Bee Gees; and would raise tens of millions of dollars for children in distressed areas around the world. The up-tempo “Tragedy” was the second consecutive #1 single from SPIRITS HAVING FLOWN, and stretched the total of Bee Gees’ chart-toppers to eight. It was also the fifth consecutive #1 for the Bee Gees, tying them with The Supremes, and placing them within striking distance of The Beatles’ six consecutive number one singles. “Love You Inside Out” was a statistically important single for the Bee Gees, helping them to rewrite the pop history books. When it went to #1, it left four accomplishments in its wake, becoming the ninth #1 single for the Bee Gees, tying them for fourth place on the list of artists with the most number ones. The single was group’s sixth chart topper in a row -- the only other group who had done so to date was The Beatles. Being the third consecutive #1 single from SPIRITS HAVING FLOWN, it marked the second time the group had three consecutive number ones from the same album (the only other artist to do so was Whitney Houston); and it brought the Bee Gees’ total number of weeks spent at the top of the chart to 27, ranking them behind Elvis, The Beatles, Michael Jackson and Paul McCartney. As the 70’s came to a close, Barry Gibb expanded his songwriting and producing roles. Besides the group’s era-defining records, younger brother Andy had a non-stop string of hits for “I Just Want to be Your Everything,” “(Love Is) Thicker Than Water” and “Shadow Dancing.” Andy, beginning with his very first single, had three straight #1 records…the first time a new artist had ever done that. Barry wrote and produced the worldwide smashes for Diana Ross (“Chain Reaction”), Dionne Warwick (“Heartbreaker”) and the title song for the movie “Grease,” a #1 hit for Frankie Valli -- making Barry one of the most sought after and successful songwriter/producers of the day. Barry produced the best-selling album of Barbra Streisand’s career, GUILTY, which included the #1 single “Woman In Love,” which was written by Barry and Robin. “Woman In Love” would become Streisand’s fifth #1 single and an international #1 in 12 countries. GUILTY would sell more than 20 million copies worldwide, making it Barbra’s best-selling album after 19 years and 35 LPs. The next two singles from the album were duets with Barry Gibb. The title track “Guilty,” would peak at #3 while “What Kind Of Fool” would reach #10. Dionne Warwick was the next beneficiary of a Barry Gibb production, and the Barry-Robin-Maurice Gibb composition of “Heartbreaker” reached #10 in 1983. Later that year, Kenny Rogers tapped Barry Gibb to produce the first album for his new label RCA. That resulted in another Barry-Robin-Maurice song going to #1, “Islands in the Stream.” For one of the songs on EYES THAT SEE IN THE DARK, Rogers recruited fellow RCA label mate Dolly Parton to sing a duet with him. The first single from the album, “Islands in the Stream,” resulted in great rewards for all involved. In addition to topping the country and adult contemporary singles charts, it won an American Music Award for “Best Country Single” and was named “Vocal Duet of the Year” and “Single Record of the Year” by the Academy of Country Music, and reached #1 on the Billboard charts. It was the only single in 1983 to achieve platinum status. 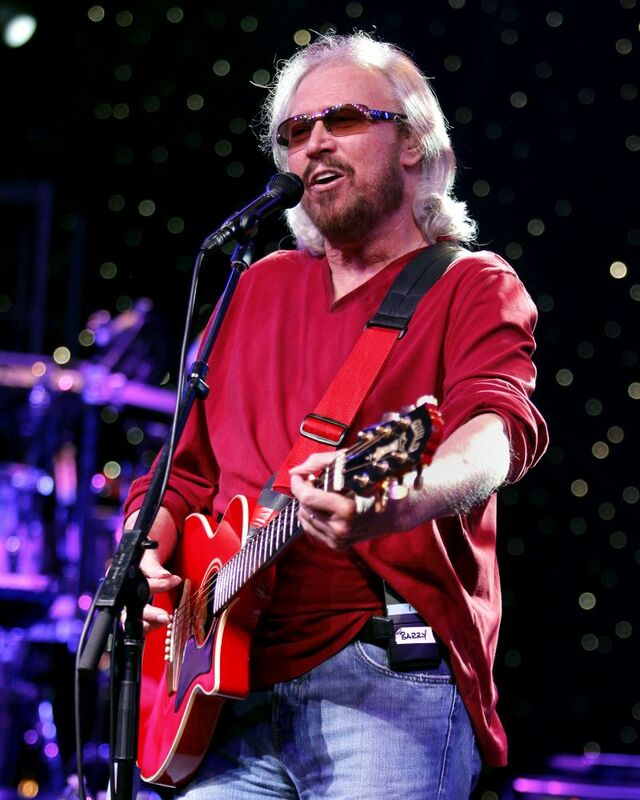 Among Barry Gibb’s many awards and honors, he is the recipient of eight Grammy® Awards (one with Streisand for “Guilty”) the Grammy® Legend Award and most recently, the 2015 Grammy® Lifetime Achievement Award. He has also been awarded the American Music Awards Lifetime Achievement Award, the BMI Icon Award, four BMI Songwriter of the Year Awards, four BMI Song of the Year Awards. He has been inducted into the Rock and Roll Hall of Fame and the Songwriters Hall of Fame. World Music Award for Lifetime Contribution to Music, the Ivor Novello Award from the British Academy of Composers & Songwriters, and in 2004, received one of Britain’s highest honors when the Bee Gees were made Commanders of the British Empire. As a songwriter, Barry has had the most consecutive Billboard number ones’ ever - with six - and is the only songwriter to have written or co-written five songs that were simultaneously in the Top Ten. He is one of two of the all-time songwriters of #1 songs, behind only the songwriting duo of Lennon/McCartney. During the late 70’s, the Bee Gees dominated dance floors and the airwaves. With matching white suits, soaring high harmonies and polished, radio-friendly records, they remain one of the essential touchstones to that ultra-commercial era. What remained a constant throughout was the Bee Gees’ extraordinary singing, rooted in three voices that were appealing individually and melded together perfectly to create the most successful brother act in the history of music. The band’s songs have become standards that are deeply ingrained in the popular songbook. Among the hundreds of artists who have recorded and/or performed Barry’s songs include: Michael Buble, Eric Clapton, Destiny’s Child, Celine Dion, Faith No More, The Gatlin Brothers, Al Green, Elton John, Tom Jones, Janis Joplin, Olivia Newton-John, Dolly Parton, Elvis Presley, Kenny Rogers, Diana Ross, Nina Simone, Rod Stewart, Barbra Streisand, Tina Turner and Conway Twitty. The music that Barry Gibb and the Bee Gees have created over the decades sets them apart as one of the few bands whose music defined an era. Barry and his wife Linda have worked very closely with the Diabetes Research Institute in Miami for the past 30 years. In their role as International Chairmen, they work tirelessly to raise funds to help find a cure for that all too prevalent disease. In February 2013, a permanent public tribute to Barry and his brothers titled Bee Gees Way, opened in Redcliffe, Australia– where in the late 1950s the three boys gathered around a microphone, and for the first time performed using the now internationally recognized name - the Bee Gees. Bee Gees Way features a life-size statue of the brothers, as well as photographs and stories reflecting on the band’s career.